Year after year, day after day, hour after hour our Ipswich River returns water to the sea. This may have been happening here since the Wisconsin Glacier more than 10,000 years ago. In Middleton we have five places to easily join the river thanks to the Middleton Stream Teamers and other volunteers who have built four landings in the past 20 years. Three of these landings have large handsome stones placed artistically on the river’s edge by Vito Mortalo at no cost to the town. On a hot muggy day recently the old Closeteer and his sister from Arizona paddled a canoe on the river. She is from a place where rivers are far apart, many dry much of the year. We here are blessed with about fifty inches of precipitation a year whereas much of Arizona in the rain shadows of mountains to the west receive only about ten. The Arizonan’s beautiful hot deserts are shades of brown, yellow and red much of the year. When she visits here the lush greens greatly please her. The humidity experienced during her visit this summer did not. The old timers sought relief on the Ipswich River’s cool waters in a shady stretch two meandering miles between Mortalo Landing on Maple Street and the Peabody Street landing. They paddled the distance in a leisurely 70 minutes thanks to Stream Teamers who with saws and loppers in June cleared passages around and under trees felled by three blizzards in March. Some suffered a week of itch from poison ivy after. Thanks also to beaver dams and above average rainfall in June and July the water level was high for mid-summer. Folks criticize beavers and shouldn’t. Their dams keep water in the river longer rather than letting it quickly run to the sea. There it stays eons or evaporates into the air to come back in a roundabout way via humid air and clouds. Stream Teamers give lots of thought to this cycle learned as children, thus reminding themselves of what a wonder the circulation of water is as the life-blood of our planet. Despite water’s necessity we poison it from billions of pipes, exhausts, and smokestacks on its rounds. We’ve done so on massive scales since the beginnings of the industrial revolution. For a longtime our country was the world’s pollution champion. Now China and India are rapidly catching up, perhaps already have. Our president and his administration want to “Make America” Champion “Again.” Where are the Rachel Carson types now that this behavior is causing havoc? The old paddlers thought of brave Rachel as they paddled past “Rachel’s Rest”, a Stream Team parklet on the river in “riverfront.” “Riverfront” is a 200-ft. wide zone measured horizontally out from the mean annual highwater elevation each side of all Massachusetts’ rivers and perennial streams. In our cities riverfront extents out 25-ft. each side from rivers’ edges. Our activities are greatly restricted within riverfront by the Massachusetts River Protection Act promulgated in 1996. 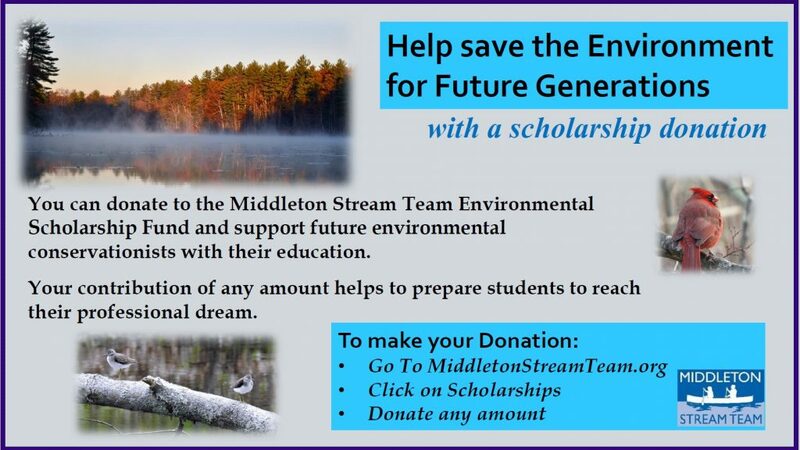 Among other things these protected buffers along our rivers provide a screen from development. Much of the two miles that the old timers paddled was done out of sight of houses. 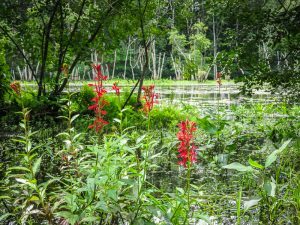 Their watery path was in a floodplain of wetland flowers, bushes and trees well populated with wildlife, mostly unseen. In mornings and evenings there is lots of shade so appreciated on such hot days. Just the appearance of clean shaded water cools the mind. While the water delighted them, the flanking flower gardens passed did so even more. This mid-summer’s patches of blooming pickerel weeds provided a grand display around almost every turn. The chicory blue of their flowers, dozens of them on the end of each stem, contrast strikingly with their green arrow-shaped leaves. Just beneath the water’s surface the long delicate stems of Potomogeton ending in handsome lance-shaped blades point on the moving current toward the sea. If in doubt at forks in the channel you have but to follow. Now and then this time of year button bushes’ spherical blooms like buttons of old catch the eye with their brilliant whites in full sun. 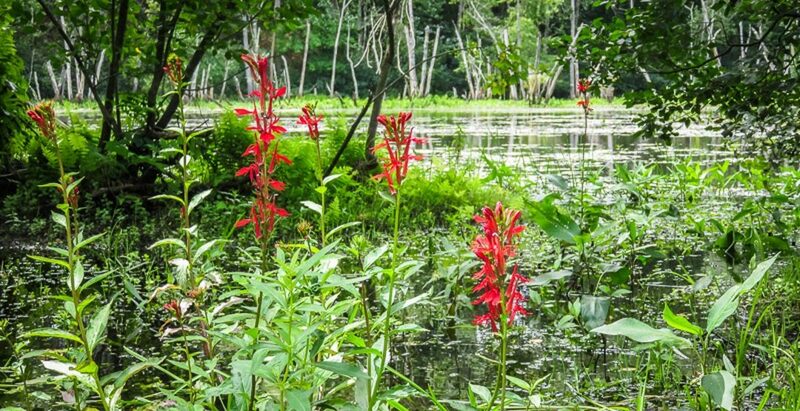 This summer cardinal flowers seem fewer and further between than in recent years. Their spikes of Chinese-red flowers have passersby marveling at them. Another once common plant that dominated the floodplains and wetlands are scattered purple loosestrife. After a decade of retreat due perhaps to Galerucella beetles brought in from Europe to reduce this beauty loved by bees and their keepers, is making a modest comeback. 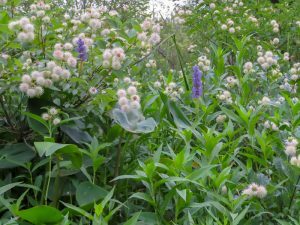 Their populations are perhaps like before this invasive plant took over our wetlands for a couple decades. The only plant that looked somewhat peaked on the old timers’ recent paddle were the swamp dogwoods, a bush common on each side of the channel. They seemed a premature fall purple. They and the button bushes have been affected by year-round, too high water due to the beaver dams. Many bushes have died in places along the river. The pleasant surprise this summer, especially in the first half mile below Mortalo Landing on Maple Street, are wild rice plants that in places soar above and compete with the now very common reed-canary grass. Reed-canary took over from the loosestrife about a decade ago. As its early ripening flowers turn brown those of the wild rice glow golden-green above in the sun. Wild rice, Zinzania aquatica, a grass, reminds of corn with the florescences reversed. 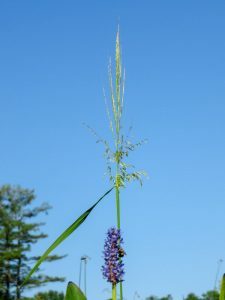 The male tassel is below the female flower thus increasing chances for cross-pollination by the wind. This year we’ve seen many more wild rice plants than in the past. Wildlife are said to love their grains as do good cooks and gourmands. 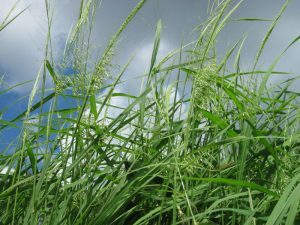 This grass long harvested in waters around the Great Lakes by Indians is now grown commercially in Minnesota and California. Our patches along the Ipswich River haven’t been dense enough to harvest by bending the tops over a canoe with sticks and tapping the grain free into it. 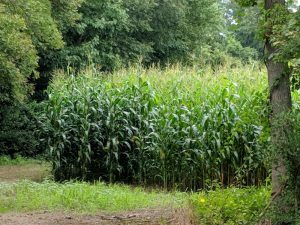 The paddle ended at the Peabody Street landing graced with tall corn in the flanking fields where generations have found Indian artifacts. Richardson Farms now grows mammoth hybrids there for its cows. Four hundred years ago Algonquian speakers no doubt raised their “Three Sisters” there. Their corn probably half the height of todays was planted far apart leaving plenty of room for squash and beans which climbed their stalks. The paddlers saw no one working in the fields. Today’s farmers come in the spring with herbicide and seeds, machine planted, and return in late summer-early fall to harvest. Only tires and tools of machines now touch the soil. There are no women and girls gossiping, fertilizing with herring, planting seeds in mounds, hoeing with sea clam shells, and harvesting as of yore. However, they were imagined by the old passersby in plastic, not dugout, canoe.